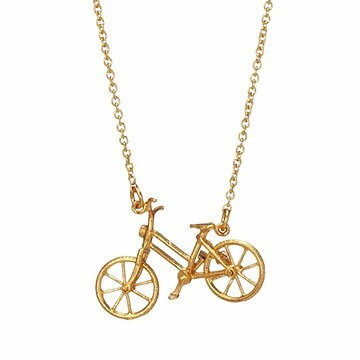 This necklace is a moving tribute to the bicycle and the thrill of the ride. With the wind in her hair and the endless open road in her sights, she put the petal to the metal. Alex Monroe does the same, creating a moving tribute to the bicycle and the thrill of the ride. He casts a petite bike from 22k-gold-plated sterling silver and adds charming, realistic touches, such as spinning wheels, and ruby and diamond "reflectors." Handmade in the United Kingdom.